I use npm as a task runner and for dependencies. It also seems like everything published to bower is also published to npm, so I’m happy to skip other package managers. Just don’t look too closely in the node_modules folder, it’s madness in there. The npm scripts are effective for defining tasks without needing to install things globally nor edit my $PATH. Any node-based CLI tools installed to the local node_modules folder via npm install are automatically on the $PATH when using npm scripts. I’d rather spend a little disk space than manage the unintended consequences of shared global state. It also helps reduce setup time for other developers. We can get away with just git clone && npm install && npm start. I also tend to make subtasks, and chain them together using the limited syntax that is shared between sh and cmd.exe. I use browserify for an awful lot of things. It’s my compiler, translator, minifier, and bundler. I tend to think of it all as compilation, but that’s a simplification. The most basic feature is using nodejs modules to write my code in many files and specify the dependencies between them using require statements at the top of each file. This nicely mirrors imports in every other programming environment (e.g. using in C#, import in python, require, require_once, include in php, etc). exorcist creates a separate source map file from the browserify output. This is really useful for testing, since most browsers will load up the source map automatically and show you you’re actual source code in the debugger instead of whatever unreadable garbage that actually gets executed. browserify-istanbul – calculate code coverage during tests, using istanbul. All in all that’s 29 direct dependencies, and probably hundreds or thousands of indirect dependencies. That still feels crazy to me, but I think that’s mostly because I have to hook it all up myself. Something like eclipse or visual studio has a ton of moving parts, but it’s one installer so I tend not to think about it. You can see some examples on some of my hobby projects: c4-lab, chore-cat, and kpi-me. There’s room for improvement (e.g. debugging tests, speed), but this setup has worked out pretty well for me. In my last post I decided against it, but then found some more tools that really brought it all together. Most of these kinds of setups include grunt or gulp, but I haven’t really needed them. Between npm scripts, browserify, endless plugins, and shell redirection I can accomplish the same results with one less dependency and config file. I feel like if I did adopt grunt or gulp, I’d basically have the same setup, but with their plugins instead of browserify plugins. Recently I’ve been experimenting with just using npm and browserify, and wanted to summarize my results. TL;DR: works well for small projects, but I think I need to add something like grunt or gulp (g(runt|ulp)). My test was a small web app to track when the last time I did a house chore: when-did-i. The source is up at ryepup/when-did-i. I’m actually experimenting with a bunch of different stuff, but I’m only going to consider npm and browserify here. Most libraries are published to npm, and I never had an issue with missing a library, and was able to keep all external libs out of my repo. The only weird thing is the version specifier in package.json. By default, if you install package X (npm install --save X), it’ll find the current version (say 1.2.3), and then add it to package.json with a version specifier like ^1.2.3. This basically means “1.2.3” or anything newer with a 1.x.y version. This can cause some surprises, especially if you have a continuous integration setup. Your CI robot might be testing different versions than what you are developing against. The solution to this is npm shrinkwrap, to specify precisely every version of every piece of software you want. It’s basically the equivalivent of python’s pip freeze and requirements.txt. This worked out well… up to a point. Using npm scripts gave me easy access to a lot of npm installed command line programs, without needing to install them globally on my system or muck about with my path. I like keeping the project’s needs self-contained. There are a ton of small tools available on npm to do just about anything. I like the simplicity; there’s no explicit “target” like other build tools, you just have a name, and what command you want to run with node’s path all setup. Then you can say npm run $NAME and it’ll go. You can add a “pre” or “post” prefix to the name to run other commands before/after. If you want to call your other scripts, you just use npm run my-other-script as part of your command. Pretty easy, pretty basic. With that combination, as I edit my files they get rebuilt and my browser refreshes. This is a pretty standard frontend development workflow, and I feel like it’s too much to squeeze into a one liner. I could make some short nodejs scripts that launch these services, but at that point I feel like I’m reinventing a wheel and I should just pull in g(runt|ulp). browserify has a pretty rich plugin system, and I used browserify-ng-html2js to support keeping my templates in separate html files. This is another place where npm scripts broke down a little. By default browserify-ng-html2js puts each html file into it’s own angular module, and then I need to make my main angular module depend on each individual template. This is back to a manually curated list that I’m going to screw up. browserify-ng-html2js has an option to put all the templates into one module, but that only seems to be available if you use g(runt|ulp). Pulling everything in via npm means I could have one bundled file that contains my code and all it’s dependencies. This gets to be kinda a big file. I added some machinery to reference some angularjs libs from a CDN, but the easist path with browserify is to have everything just included. I guess if you’re using cache headers well and versioning in the URL this might be alright. Rigth now I’m at 264KB (73.4KB over the wire) which does include some dependencies. Letting browserify combine ALL my dependencies would more than double the file size. I’m really not sure if that matters, but it makes me nervous. In the past I’ve used some grunt machinery to maintain the list of scripts to load; I liked this a little better because what I was developing with was closer to what I’m deploying. I like the browserify and npm combination, but npm scripts are too limited, and another build tool is required. I think npm scripts are good enough as a task runner for simple dev or CI, but build steps just need more configration. It’s possible that maybe the specific build libraries could better support looking at package.json for configuration, but there’s just a lot more momentum behind using g(runt|ulp). ASP.NET has changed dramatically in the past five years. I’ve had the privilege to work on some projects using the newer web stacks, as well as modernize an old project. I threw a lot of pasta on the wall, and here are a few that seemed to stick. Everything is available via nuget, except for the LocalDb installer. Some of these are warrant further discussion. Very fully featured data access library. There’s a ton of depth here. ASP.NET WebApi and ASP.NET MVC are very similar, and the two are being combined in ASP.NET vNext. They can also work together in one web project, albeit with different namespaces. It’ll be nice when ASP.NET vNext unifies these namespaces. Pretty straightforward dependency injection library. You tell it what implementation you want for what interface at application start, and then ask it to create all your objects. This is the dev/test database I’ve always wanted. I kept going back and forth on this one; sometimes it’s a great time saver, sometimes it’s a huge hassle. Overall I think it’s a win. When you have a lot of data transfer objects (DTO)s it can be really common to want to copy fields from one type to another. I’ve been having fun with Raspberry Pis recently. I’ve got one setup with openelec that I bring on camping trips, with some movies on a USB hard drive. By default, the pi doesn’t provide enough power on it’s USB ports, so I had to use an external USB hub. This meant two AC adapters, and lot more cabling. After some research, I found it’s possible to increase the power output on the USB ports (lock in auxillary power?) from 600mA to 1.2A. Testing & Setting the USB current limiter on the Raspberry Pi B+ has the details; you can use gpio to temporary bump the power, and then edit config.txt to retain that setting on reboot. So it needs to find libwiringPi.so and libwiringPiDev.so. the wiringPi compiled output has wiringPi/libwiringPi.so.2.0 and devLib/libwiringPiDev.so.2.0, so we make a directory with those symlinked in, and then tell C to look for shared libraries there. Now gpio can find it’s libraries. I was able to test my usb hard drive, and it works with 1.2A! Last week I was doing some cleanup work (short holiday weeks are great for paying off technical debt), and was deleting some supposedly unused code. This was a pretty tedious process of running functions like slime-who-calls and slime-who-references, running git grep -i on the command line, and undefining functions in just the right order. I’ve seen a lot of articles recently on static analysis of code, and spent some time playing with the introspection features of slime to identify unused code (short holiday weeks are also great for following a tangents). I ended up with a slow mudball of code that worked pretty well. Warning, large images coming up. 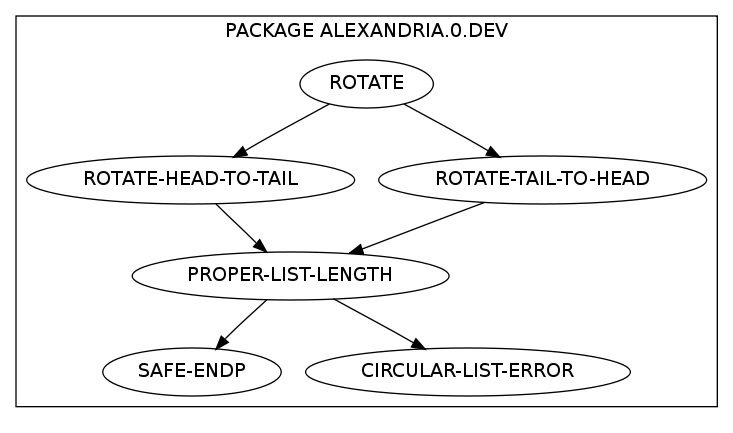 The code currently scans all loaded code, and puts functions from each package in it’s own graphviz subgraph. The graph for an entire package for all loaded code isn’t really that useful, so I made another function to narrow it down. Here I’m specifying the list of packages to render, and the list of functions to show. Anyhoo, a fun toy, and I had a fun time writing it.